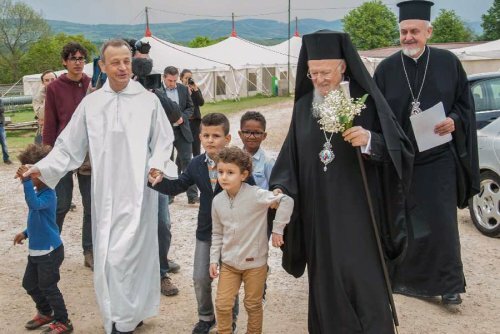 If this is the first time that an Ecumenical Patriarch of Constantinople visits your community—we are particularly pleased that this opportunity has been offered to us—Taizé’s ties with the Ecumenical Patriarchate go back a long way. Indeed, as early as 1962, Brother Roger had first visited the late Ecumenical Patriarch Athenagoras at Constantinople. Brother Roger quickly became a heart-brother of Orthodoxy, as the ecumenical mission he wished to bear largely embraced all the families of Christianity, each according to its own identity. We believe that to this day you have preserved the icon that the Ecumenical Patriarch Athenagoras entrusted to him. This icon of the Mother of God represents not only the spirit of fraternity that we are trying to make grow in the shadow of the protection of our common Mother, the Virgin Mary, but, more generally, the perspective in which our prayer in favor of the unity of Christians is situated. As if to mark the unbreakable link between Taizé and Orthodoxy, on April 15, 1963, the first stone of an Orthodox chapel was laid at Taizé, confirming with this gesture the immutable presence of Eastern Christianity within these walls. You, dear Brother Alois, have faithfully summed up this beautiful tradition that unites us. We remember with emotion receiving you at Phanar twelve years ago on the feast of the Nativity of our Lord. On that occasion we were able to show you our strong attachment to the meetings of young people which you regularly organize at the turn of each year, as if to testify that the passage of time inexorably brings together divided Christians by allowing them to progress together on the way of unity . Every year, you do us the honor of conveying our message to the participants of the European meetings. We are particularly happy to be able to address these young European Christians who, for a few days, experience, even imperfectly, the communion to which we aspire. Did not Brother Roger like to say: “Christ did not come to earth to start a new religion, but to offer every human being a communion in God.”? Let us also mention the pilgrimages of trust on earth which form an important part of your ecumenical work. Today you are receiving us in this beautiful Church of Reconciliation. The theme of reconciliation is central to Christianity and in our opinion we must distinguish three levels of reading. The first level is the relationship of the reconciliation of the human with the divine. The work of Christ in the world is a work of reconciliation that goes beyond religion in that it links vertically and horizontally the Creator and creatures. Reconciliation in Christ places him at the center of what humankind accomplishes as an image of God and in a dynamic relationship of resemblance. Christ is reconciliation. Remember the words of the Holy Apostle Paul: “For it was God who in Christ reconciled the world to himself, not imputing people’s sins to them, and putting the word of reconciliation in us.” (2 Corinthians 5:19) It is interesting to note that Saint Paul, in the preceding verse, speaks of a “ministry of reconciliation.” (2 Cor 5:18) Reconciliation is the yardstick by which we must measure our communion with God and our unity in the Church. The second level stems directly from the “ministry of communion” that we have just mentioned. In fact, it is more ecumenical. It responds to the commitment to Christian unity in which the reconciliatory action we have to undertake takes its place. If we were to use only one image, we would use that of healing. To reconcile is above all to heal the evils of history, the scars of time, mutual misunderstandings, conflicts of memory, fratricidal hatreds. In this sense, the division between Christians to which we intend to respond by praying for the unity of the Churches is a spiritual wound, with shared responsibilities—whether accepted or not. Indeed, in the ecumenical era and at the time of the search for unity, there can be no reconciliation without forgiveness. Besides, for St. John Chrysostom, reconciliation cannot be put off. If we want to be true actors of reconciliation, we must assume our responsibilities and be ready to take the first step. By his death and resurrection, Christ reconciled us to God. As we sing the Easter hymns, Eastern and Western Christians together, let us continue to pray that the light of the resurrection will lead us on the path of unity and communion.